The great thing about disc golf is that you don't need a luxurious course to play on. However, isn't it even that much better when you are on a great course? We have scouted out the best courses around the country, and have made a list of the best courses you can play on! Although this finished second in the DG Course Review's 2016 best disc golf courses, this course has too much praise to not put it at no. 1. Despite it being a private course and 3 dollars for an entrance fee, this course contains the variety and scenery of a great course. Started back in 1980, Flip City Disc Golf Park spans a total of 7,679 feet for professionals and 5,693 feet for amateurs. Take a trip up to Michigan to see this well-known and recognized 24-hole course! Selah Ranch Lakeside is reviewed as the no. 1 disc golf course, according to DG Course Review. However, although the quality of the Selah Ranch course is top-of-the-line, you are also having to pay that price. A daily greens fee of unlimited play is a whopping 20 dollars! If you can afford to drop a pretty penny to play, then this would be the course for you! It has received a 4.93 course rating compared to Flip City's 4.85. Three tees per hole, a pro shop and camping available; this course has it all! The course is a cheap $5 dollar entry, and is open 6 AM to Midnight daily. The course has red baskets that light up during the night. You have the option of buying an annual pass, if you cannot resist returning to this course over and over. This course is definitely not a one-trick pony! This course is as quirky and wild as its' title. 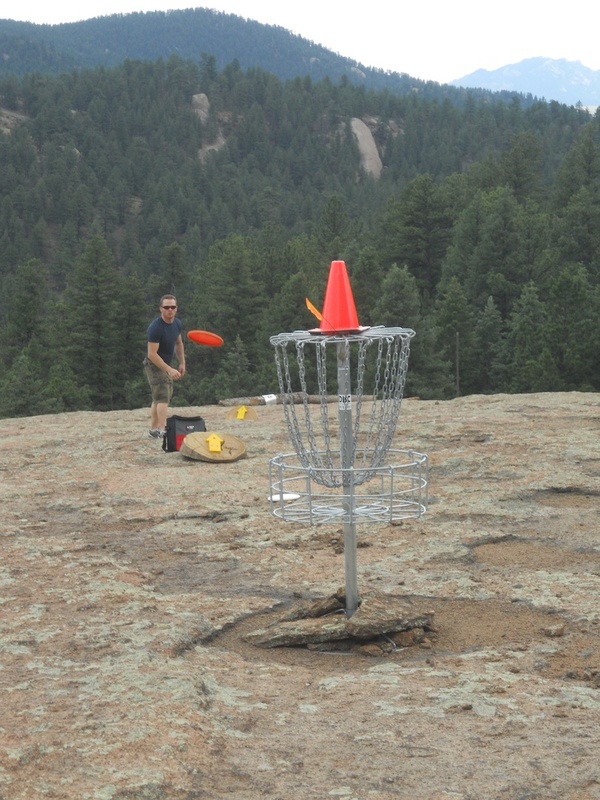 Bucksnort DGC, located on a plateau between Pine Grove and Sphinx Park in Colorado, is definitely worth the reservations you have to make to play here. Although the course itself may not be as highly-rated as some of its' adversaries, according to their website it has been "described by some as the most scenic disc golf course they have ever played." Bring your hiking shoes and cameras. Trust me. Although this is no. 8 on the DG Course Review best disc golf courses to play, it is the most favorited course, second most played and second most wishlisted! This 24 hole course has water hazards, hills and heavily wooded areas. If you aren't a gunslinger, this may be the course for you because it's not just designed for those who can throw the disc extremely far. After you check out numero dos on our list, walk on over and try out this prestigious course as well. The lakeside and creekside courses are championship courses. This course is relatively young, being established in 2011, and has received an impressive 4.79 course rating. Over 400 people have wishlisted this one, so see for yourself what all the fuss is about. Come to Beaver Ranch! The fifth best top destination disc golf course, sixth most favorited and eighth most wishlisted. Here's a little amateur highlight video filmed while playing this course if you want a little preview. Although the conditions can be bad from time to time due to snow, the views of the mountainous terrain will not disappoint. Bring 10 dollars for a day pass, but children 15 years and younger are only 5 dollars. Women are free to play for free on Sundays! Although you won't see this among the highest rated courses, it is the most played course in the country according to DG Course Review. The first disc golf course in San Francisco has been played over 1500 times. This course can be played by those who are new to disc golf, and those who are looking for a challenge! For those of you who are looking to get a quick game in but don't have time to play a full course, try out the best nine hole course in the country! This course is mainly in wooded area, demanding more accurate shots instead of long drives. Welcome to the second top destination disc golf course! If you are looking for an affordable, scenic and adventurous round of disc golf, you have come to the right place. This course is only two dollars, and you can even camp nearby, if you are interested. Although this list may not contain the highest rated courses, we wanted to include a wide variety of courses that can appeal to a wide variety of disc golf players. Whether you are a professional looking for a challenge, or if you are a casual disc golf player looking for some scenic views, this list has the answer! Now get out there and take on some of the best courses in the country! This course may not be on your radar because it is one of the newest courses on this list! Being established just in 2015, VisionQuest has managed to climb right outside the top 10 in top courses in the country. This well-kept course requires a membership, which you will have to fill out an application. 8:00 AM- Dusk, 7 days a week this course is running, so you don’t have an excuse to make a trip up to Cedar! According to DG Course Review, “The De Laveaga Disc Golf Course is one of the most highly rated disc golf courses in the world.” It was started back in 1984 with the guidance of the 1991 Grand Master World Champion Tom Schot. Originally only an 18-hole course, it has now expanded to 19 holes, some of which are considered professional “pole holes.” Enjoy the scenery and the history of this course! Have you ever been curious as to where the first disc golf course is? Look no further than Hahamonga Park. This is the first permanent disc golf course in the world. Installed back in 1975, this 23-hole course will give you a challenge but also nostalgia. Come see how this crazy disc golf game all began! This course hoisted in the mountains allows for one tee time per day…you read that right. The 27-hole course allows for only one tee time per day because the management wants people to enjoy the course, take their time and take the scenery in. They even have a mini disc golf course, which includes nine professional holes. Bring your wallet as well to stop by the professional shop. 97 discs have been lost on this course. So, bring a spare few discs, as the risk/reward factor of this course is evident. Halfway through the course is a concession stand, so no need to load up on snacks before playing this one.